Movie Review: Acclaimed indie filmmaker Jim Jarmusch opens his contemporary vampire tale with a great shot: camera moving in circles following the movement of a vinyl record spinning, and showing the two protagonists, Adam (Tom Hiddleston) and Eve (Tilda Swinton), both vampires who are in love for centuries, but currently live physically separated. While she runs through narrow alleys in Tangier to find her blood dealer, he drives across the dark roads of Detroit to reach the hospital where he buys blood. Stating their appetite with their favorite drug, they show the pointed canines with pleasure and ecstasy. After speaking with each other, Eve senses the depression and discouragement of Adam who plans to kill himself with a 38-caliber bullet made of dense wood. She decides to be with him, but the arrival of Eve’s sister, Ava (Mia Masikowska), will bring uneasiness and trouble. Well-set scenarios help to compose the almost lyrical, contemplative atmosphere, adorned with medieval sounds and psychedelic rock. Don’t expect standard vampires, since the ones depicted here are more mature, controlled, and artistically cultivated. Only Ava showed not to be in the same level as the others, obeying to her strongest impulses and behaving irresponsibly. 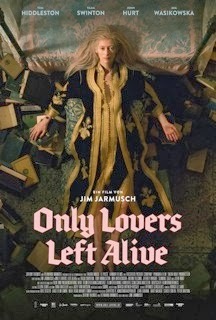 Many factors made me identify “Only Lovers Left Alive” as a Jarmusch film. Despite narratively more direct than some of his previous works, and without climax, I found it conceptually more interesting than “Byzantium” and much more adult than “Dark Shadows”.